Peutz­-Jeghers Syndrome, treated at our New York practice, is a genetic disorder that causes the formation of abnormal tissue growths in the gastrointestinal tract. Dr. L. Brian Katz at Laparoscopic Surgical Center of New York is considered a world-renowned expert in this particular surgery and uses advanced laparoscopy and endoscopy techniques to eliminate polyps and prevent further complications. If left untreated, patients are at a higher risk for polyps developing into certain types of cancer. Peutz­-Jeghers Syndrome, also known as PJS, is a genetic condition that is characterized by growths in the stomach or intestines (gastrointestinal tract). These noncancerous growths, called polyps, can begin developing in early childhood and continue to grow throughout adolescence and adulthood. PJS can put you at a higher risk for gastrointestinal, breast, stomach, pancreatic, ovarian, cervical, and testicular cancers if left untreated. Many of these polyps can begin developing in early childhood, so genetic testing and proper screenings are vital in detecting PJS early. These tests can help prevent serious health issues, such as intussusception and cancer from occurring. Intussusception is usually caused by the overgrowth of multiple polyps. When this occurs, part of the intestine slides into another part of the intestine, preventing food from being digested. It can also block blood supply, which can eventually lead to perforation, infection, and possibly kill healthy bowel tissue. During your appointment with Dr. Katz, he will perform an examination that may include genetic testing, laboratory testing, endoscopy, and scans to determine the severity of the polyp growth. After reviewing the results, he will tailor a treatment plan to meet your individualized needs. In most cases, surgery will be necessary to remove the polyps, especially if intussusception has occurred. 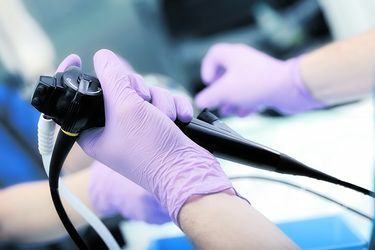 As a leading expert in this particular surgery, Dr. Katz can conduct this minimally invasive procedure using advanced laparoscopic techniques and treatment. By combining state-of-art technology and unparalleled skill, your doctor can deliver personalized care with optimal results. At Laparoscopic Surgical Center of New York, our doctors will make themselves completely available should any questions about your treatment arise throughout your entire health journey. Seeing your doctor for regular follow-up appointments will also allow him to carefully monitor you for the recurrence of polyps and/or changes in the development of the polyps. Living with a colon condition can be extremely frustrating, but our treatment can restore your health quickly with a reduced recovery time. Our entire staff is committed to providing patients with the highest level of care available, and your health and safety are our top priorities. To learn more about whether your colon condition can be treated using laparoscopic surgery, schedule a consultation with one of our doctors today.